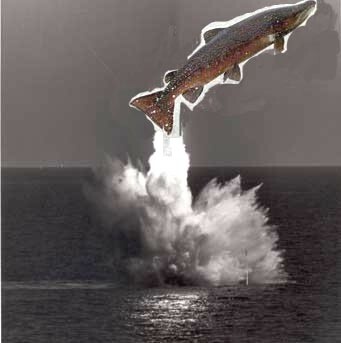 WADING up to the armpits, casting a long line over the slow, deep water of the Meetings, I dream of hooking a missile salmon, just as John Ellis did in 1998. For those of you who perceive the upper stretches of the Moyola as a mystery, the Meetings is as the name suggests, the joining of the Moyola river with the Douglas tributary. And it is of course, one of the busiest half-way houses for salmon destined for both rivers. As a complete novice to salmon angling, I spent many happy hours just sitting at the Meetings, drowning worms and feeding the piranha-like trout. But every now and again the tranquility of the Meetings would be broken by the spectacular leaps of the resident salmon, as if asserting their status as Kings of the river. And so it was on a day like that, that I encountered one of the most astonishing escape acts by a salmon I have ever seen. After weeks of constant rain, the summer of '98 saw countless salmon skipping through the Moyola, running hard to the upper reaches to the security of large pools like the swirling Meetings. Showing salmon were as common as rising trout, when John Ellis stepped into the pool that day. I had been told many times that shrimps were useless in high black water conditions, and content with this 'knowledge' I scoffed as I clocked the unmissable orange float on John's line. How wrong I was. John - a stranger to me then, said 'hello' and rigged up his shrimp. 'Wasting his time' - I thought, as I removed another sorry sodden worm from my hook. But still, I couldn't take my eyes off the orange float as it glided down the pool directly over the area where salmon entered the pool. Nowadays I concentrate on my own casting, watching for any signs of a fish, but on that day I just sat back and watched. Memory tells me there was an air of expectancy in the Meetings arena. It wasn't long until John's float stopped, bobbed about, and then disappeared below the surface, met with a lightening strike by John. We didn't see the fish, but we both agreed that it shook its head and spat out the 'purple worm'. Without missing a beat and apparently unperturbed by the loss, John continued to try and tempt another fish from the depths of the Meetings. I can't say exactly how many takes John had in his short time there, but watching that float was like waiting for a casino roulette wheel to stop. And John had the Midas touch, landing a fine, fresh salmon of around 6lbs after another 10-15 minutes. A quick inspection of my bait made me question if I was fishing the same pool, and so I resorted to spectating. Again the float went under and again the response from John was immediate, striking and snaring the fish. The salmon shot across the pool, staying deep. Minutes passed and slowly the fish appeared to succumb to the power of the angler. John reached for his landing net as the fish circled closer, occasionally breaking the surface. With the battle seemingly over, the fish made one last leap for safety. Looking back, I believe the salmon's missile-like assault on John was premeditated. I have watched salmon jumping near-impossible waterfalls on Discovery channels, but I have never seen a salmon jumping and striking an angler, as this one did, rocking John back on his heels. I'm not saying the fish was a 20-pounder or even double figures, but the thud was audible, the force immeasurable. Remarkably the fish was still hooked, but the balance of power had shifted and the fish seized the opportunity to slip the now loosened hook. Recounting this story verbally usually takes about a minute - 'you had to be there to believe it' I tell the doubting faces. On that day in '98 I realised the joy of catch and release. Up to that point, if it had gills then it was priested. However after watching John on that day [and many other days] releasing his salmon, I understood that the joy is in the 'take' and 'fight'.